Dorstone’s Front Room (DFR) began life in 2008 when the village of Dorstone was informed that we would lose our small rural post office. For Dorstonians, the loss of our post office was a blow. Like many rural communities, the post office was the daytime hub of the village. It served as meeting place, information centre, last minute gift resource, and social glue. So, we set out to replace what we were losing. With the help of over twenty-five village volunteers and a number of terrific funding resources DFR has become a key part of our rural life and a unique place to share a taste of what it’s like to live in our beautiful rural community. Today DFR‘s team of committed volunteers continues to keep us at the heart of our vibrant community. 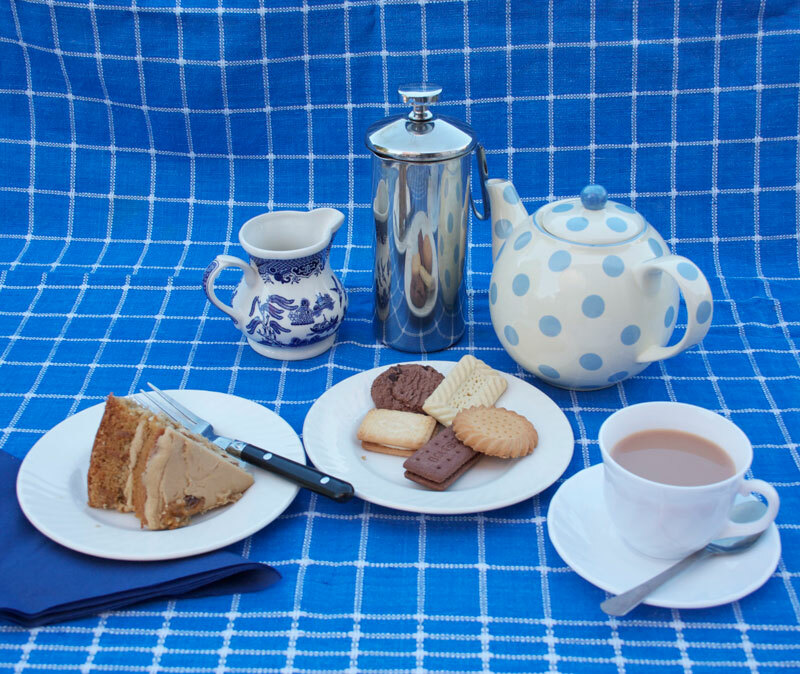 DFR offers a comfortable setting for tea, coffee and locally baked cakes. We are also famed for our Friday Bacon Butties. Part of DFR's mission is to provide a cost-effective venue for the sale of crafts and artwork created locally. DFR is a registered Tourist Information location. We can provide local information and parking and route maps for walkers. DFR provides a host of services for the local community from a Book and DVD lending library to a Bulk Heating Oil Group and Office Services. DFR offers a cozy setting for teas, coffees and local cakes every day that we are open. Please join us whenever you want a little break from your everyday hustle and bustle! At the end of every week, we host our regionally famous Bacon Butty Fridays with the best bacon buttys for miles around served from 9:00 – 12:00. Out Post Gallery @ DFR maintains a regular collection of high quality crafts by very local artists. We regularly have prints and local photos, cards and postcards, ceramics, wood-craft, glass art, jewelry and forestry products (willow, baskets, etc.). Our Artist-of-the-Month exhibits in the main area of the Front Room. and other useful support for visitors. Visitors are welcome to use our car park as a walking/cycling base and DFR is happy to open to accommodate post walk/cycle refreshment. DFR offers a wide range of paperbacks and some videos for lending or purchase. If you borrow a book or video, the cost is £2.50 for DVDs and £1.00 for books (£0.50 of which will be returned to you when you return your book). We welcome periodic contributions of books – but only those that you found too good to put down! DFR offers a wide range of office services including internet access (with wi-fi), printing (B&W and colour), photocopying, faxing, laminating, and a small range of office products including stamps. DFR sponsors a bulk heating oil purchasing group. Orders are placed monthly on the first Friday of the month. We generally contact a number of local vendors before selecting the one with the current lowest price. In most cases we are offered a price that is 2p below the public price quoted on the day of placing the order. We contact you to inform you of delivery date. You will be invoiced by the supplier, and DFR charges a small administration fee of 0.0025p/litre. A mobile postal van visits the DFR car park on Wednesday mornings. When the post van is not here we also have a limited number of postage stamps for sale. If you are interested in having a daily newspaper delivered to Dorstone. If you are interested in having a daily newspaper delivered to DFR, please contact us to discuss arrangements. DFR serves as the Dorstone Village emergency centre during inclement weather or other times of emergency. For more information on helping to provide emergency support, or to add your name or a relative’s name to our emergency “check-in” list. An emergency Defibrillator is located on the outside wall to the left of the DFR main entrance. If you need access call the number on the outside of the box to obtain the access code. Then follow the instructions. DFR maintains an up to date list of events in and around Dorstone and the Golden Valley, as well as information on local businesses, business services, suppliers, etc. Please feel free to stop in and talk with any of the volunteers about general information needs. If we can’t help you on the spot, we’ll get information to you as soon as possible. DFR only operates thanks to the hard, dedicated work of our marvellous volunteers. 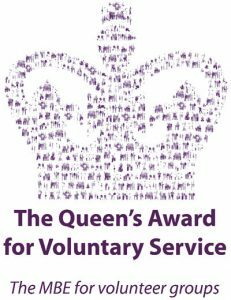 This dedication was recognised by Her Majesty in 2006 when we were awarded The Queen’s Award for Voluntary Service, the MBE for volunteer groups. Volunteering at DFR is fun – whether it’s a quiet day with one or two local residents lingering for a long chat and a go at our always-on puzzle, or one of DFR’s famous manic days with visitors, the crochet group and food deliveries. Volunteers generally serve one 4-hour session every two weeks. We welcome “regulars” as well as “irregulars” to fill in the gaps. Please contact Gill if you are interested in volunteering. Dorstone’s Front Room is located in the village of Dorstone in the Golden Valley of western Herefordshire. We’re open 9:00 a.m. to 1:00 p.m., Monday-Friday. We are delighted to schedule additional openings for groups and regularly welcome walking groups, cycling groups and riding groups as well as clubs and private gatherings.